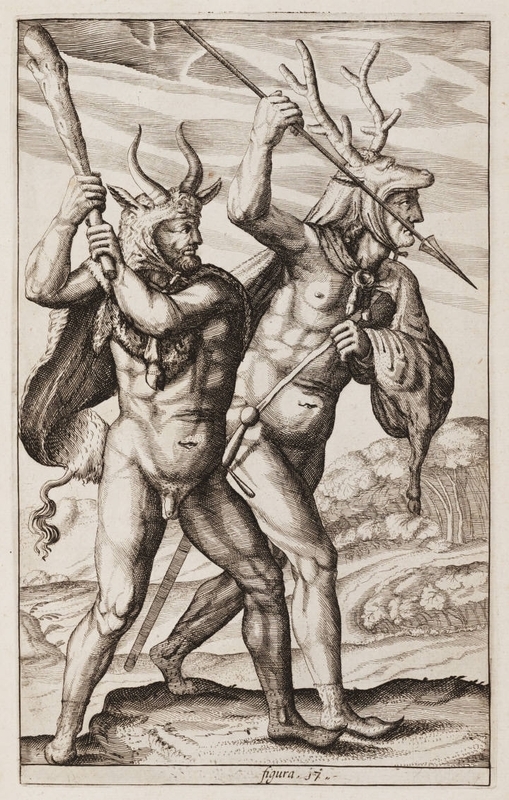 Germanic warriors as depicted in Philip Clüver's Germania Antiqua, 1616, courtesy of Yale University Library’s Beinecke Rare Book and Manuscript Library. Drawing demonstrates perceptions of "barbarians" or "savages" during the Roman Empire. Romans believed "barbarian" groups in Europe such as the Germani or Gauls were childlike, sexually promiscuous, and mentally and physically inferior. Similarly degrading stereotypes would reemerge from Europeans about Africans and American Indians with European expansion into the New World. Early forms of western European racial prejudice first began between Europeans. Ancient Greeks described “other” European groups, such as Scythians and Celts, as barbarians and savages. They often defined their prejudices based on physical preferences for certain bodily and facial features, including lighter skin, and discouraged intermarriage. Greek scholars such as Hippocrates attributed place and climate as the defining factors in shaping different physical appearances, and they additionally argued that certain physical traits signified mental and behavioral inferiority. Ancient Romans believed that being “civilized” marked their superiority, both physically and mentally, over the Gauls and Germani of Europe. By the Middle Ages, European Christians also stigmatized the color “black,” and associated it with sin and death. The darker skin of European laborers who worked outside with sun and wind exposure led elites to link skin color and darkness to servitude, long before New World slavery. During later divisions and conflicts throughout Europe, combatants continued to claim physical and mental superiority over their opponents to justify military and labor subjugation. For example, during the British conquest of Ireland in the sixteenth century, the English monarchy characterized the Gaelic Irish as morally and physically inferior, as well as darker skinned, in comparison to the "civilized" English population. 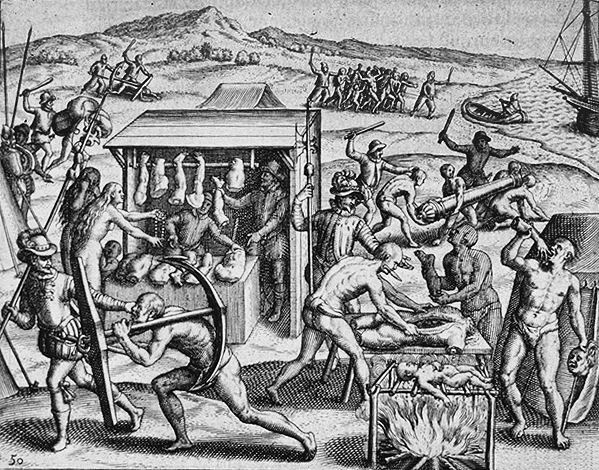 Depiction of Spanish explorers exploiting American Indians in South America, as recounted by Bartolomé de las Casas in Narratio Regionum indicarum per Hispanos Quosdam devastatarum verissima, drawing by Theodor de Bry, 16th century, courtesy of the Newberry Research Library. European concepts of conquest combined religious prejudices and stereotypes of physical and mental inferiority to justify subjugation as a civilizing force. These conquest ideologies took on a major economic purpose with New World expansion, when Europeans used physical and religious differences to justify the large-scale enslavement of Africans and displacement of American Indians for labor and land control in plantations and mines. Notably, as the economic incentives for subjugation increased, European racial stereotypes about Africans became more derogatory. As historian Ira Berlin notes, during New World expansion, Europeans initially characterized West and Central Africans as "sly, cunning, deceptive . . . perhaps too clever." These stereotypes were not unlike the stereotypes Europeans made about one another, and they reveal a begrudging sense of equal competition rather than white superiority. 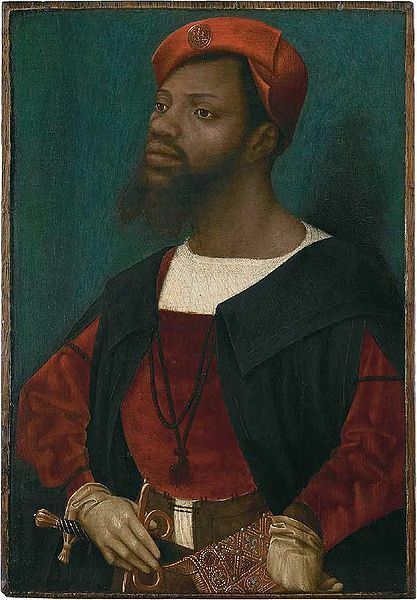 Portrait of an African Man, painting by Jan Mostaert, ca. 1520-1530, courtesy of Rijksmuseum Amsterdam. While the subject’s name and status are not noted in historical records, he was painted by Margaret of Austria’s portraitist, Mostaert. Mostaert regularly painted Margaret’s courtiers, and the subject of the painting is dressed as one. This painting demonstrates Atlantic Creole influences, and how early depictions of Africans by Europeans were not necessarily derogatory before the increase of racial stereotypes with New World chattel slavery. With the rise of African slavery in the New World, Europeans shifted these stereotypes to support a racial hierarchy where Africans and African Americans were depicted as animalistic, servile, unintelligent, and sexually promiscuous. As Berlin explains, “the nature of slavery – the relationship of black and white – determined the character of racial ideas.” New World racism developed to justify New World slavery. Over time, this racial boundary of "white superiority," and the belief that Africans and American Indians belonged to inferior races, grew to influence European social, political, legal, and labor systems throughout Atlantic World societies. However, shared white racial privileges did not mean conflicts between European nations ceased. The French and the English, for example, proved more than willing to repeatedly go to war with one another. Despite ongoing conflicts, neither nation was willing to enslave one another or their own citizens based on their prior history of competitive balance, and a growing sense of white racial superiority over non-Europeans. Enslaved Africans and American Indians consistently resisted their secondary status within this developing racial hierarchy, and many began to demand access to the labor and mobility rights enjoyed by Europeans in the Americas. They enacted this resistance in a range of ways, including running away, open rebellion, and warfare. In response, European slaveholders in the Americas enacted rigid laws to enforce racial hierarchies and subjugation, and used tactics of violent coercion to secure chattel slavery. By the eighteenth and into the early nineteenth centuries, these racial hierarchies became systemically entrenched throughout American social structures and institutions. Freedom became associated with white Europeans and their Euro American offspring, while slavery became associated with non-whites, particularly people of African descent and their offspring. Still, this racial barrier between slave and free never became absolute in the Atlantic World. Instead, oppressive racial boundaries in various international contexts were challenged and eventually overthrown and redefined. During the Age of Emancipation in the late eighteenth and nineteenth centuries, chattel slavery legally came to an end throughout the Atlantic World through a combination of abolition movements, slave rebellions, and in the case of the United States, civil war. Even after emancipation, Atlantic World societies continued to struggle with the unjust legacies of racial slavery, particularly during twentieth century civil rights movements. But as historian Ira Berlin asserts, "that [racism] could be made in the past argues that it could be remade in the future." Racism is not a permanent fixture of human societies. Instead, as Atlantic World history reveals, it is a social construction built through constantly changing historic circumstances. Racism can be challenged, changed, and undone. 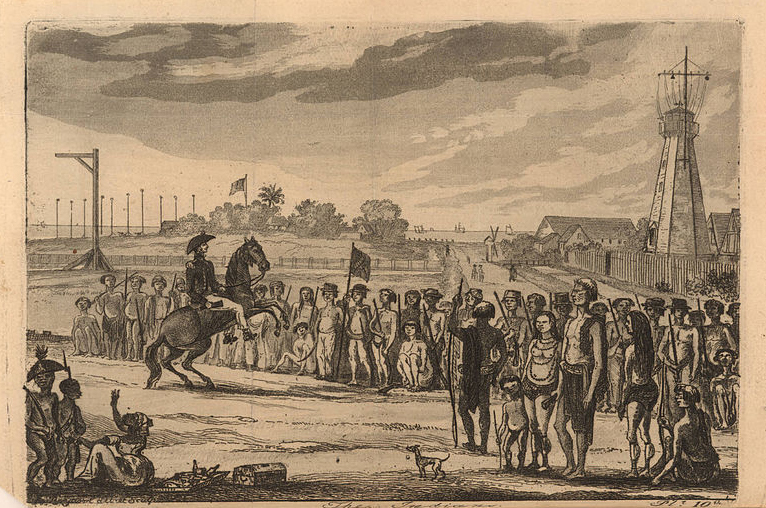 Depiction of a slave insurrection in the British colony of Demerara (now Guyana) on August 18, 1823, created by Joshua Bryant, 1823, courtesy of John Carter Brown Library at Brown University. This rebellion helped draw international attention to the atrocities of slavery in the British Empire, and bolstered the British anti-slavery movement.